HARD TO FIND 11 ACRE PROPERTY IN PALM BEACH GARDENS.THIS UNIQUE PROPERTY IS COMPLETELY FENCED WITH PLENTY OF ROOM FOR A GUEST HOUSE AND STABLES.WOULD MAKE A GREAT FAMILY COMPOUND OR NATURE RETREAT.LOCATED BETWEEN IBIS AND BAY HILLS COUNTRY CLUBS,THE RUSTIC LAKES COMMUNITY RETAINS ITS RELAXED COUNTRY FEEL.FROM THE MOMENT YOU ARE USHERED THROUGH THE IRON GATES, AND DOWN THE TREE LINED DRIVEWAY, A SENSE OF QUIET SERENITY GREETS YOU AS YOU APPROACH THE GRAND ENTRANCE TO THE MAIN HOUSE.A TWO ACRE POND STOCKED WITH FISH SURROUNDS THE HOUSE LIKE A MOAT, AND AN ISLAND WITH A TIKI HUT THAT IS CONNECTED BY A BRIDGE. THE HOME FEATURES SIX BEDROOMS PLUS A LARGE GARAGE APARTMENT/OFFICE/STUDIO.THE SPACIOUS MASTER BATH IS ELEGANTLY APPOINTED WITH LARGE SPA TUB AND DUAL SHOWERS.THIS HOME IS GREAT FORENTERTAINING. THE HEART OF THE HOME IS AN EPICUREAN'S DREAM KITCHEN GAZING OVER A LARGE GATHERING ROOM WITH WOOD BURNING FIRE PLACE. THERE ARE 16 FT. CEILINGS THROUGHOUT THE LIVING AREAS. AN OUTDOOR KITCHEN IS LOCATED NEXT TO A 50 FT OASIS STYLE POOL WITH A LAP LANE, AND AN OUTDOOR DINING AREA IS CLOSE BY. 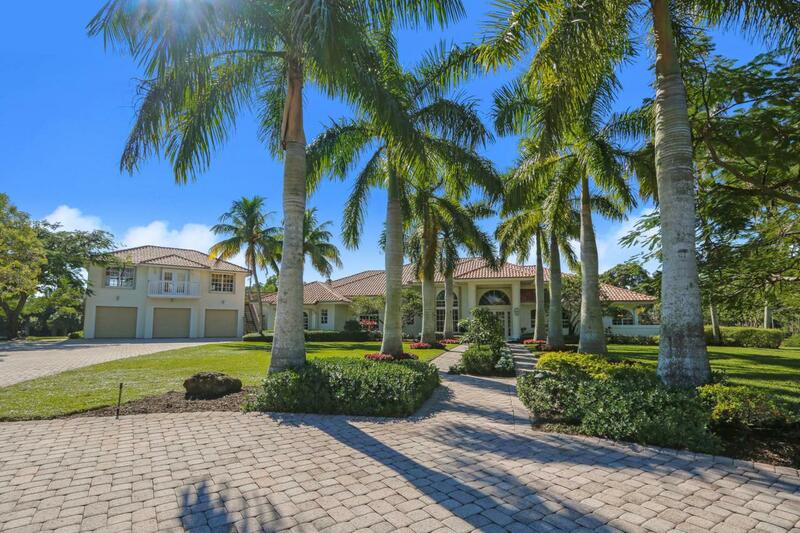 THIS HOME BLENDS LUXURY AND TRANQUILITY FOR AN IDEAL FLORIDA LIFESTYLE. LESS THAN 30 MINUTES TO PALM BEACH INTERNATIONAL AIRPORT AND CLOSE TO EVERYTHING THAT PALM BEACH COUNTY HAS TO OFFER!